The title entered here will be shown for the checkbox in the browser. The value entered here will be used for filtering. 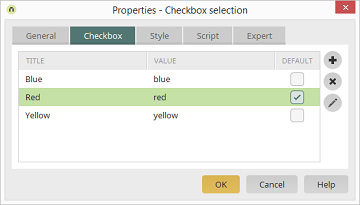 If the setting in this column is active, the respective checkbox will automatically be shown as active in the browser. Deletes the row currently selected. Opens a dialog where the title can be modified in the corresponding portal languages.